You can contact me at hillary@yogawithhillary.com or just use the contact form. After originally studying Yoga in the 1990s at the California Yoga Center in Palo Alto, Hillary returned to consistent Yoga practice in 2009 to ease discomfort associated with work as a Technical Writer/Editor in science-based corporate America, where she still works. Her style is influenced by the Yoga teachings of B.K.S. Iyengar, author of "Light on Yoga." This method emphasizes proper alighnment and develops body awareness, strength, and flexibility. A graduate of the 500-hour Advanced Studies Teacher Training Program at The Yoga Room, in Berkeley, Hillary has RYT-500 certification with Yoga Alliance. 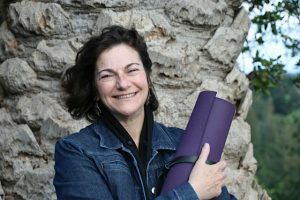 Her continuing interests in Yoga and science include study in human anatomy, kinesiology, plant medicines, meditation, breathing practices, ceremonial singing, and restorative Yoga. Hillary continues her studies primarily as a student of Ada Lusardi (The Yoga Room, Berkeley, CA), with additional influence by Vickie Russell-Bell (Oakland, CA), Richard Rosen (Piedmont Yoga Community, Oakland, CA), Yoko Yoshikawa (Piedmont Yoga Community, Oakland, CA), JinSung (Oakland Yoga Studio), and other amazing instructors in the SF Bay Area and beyond.